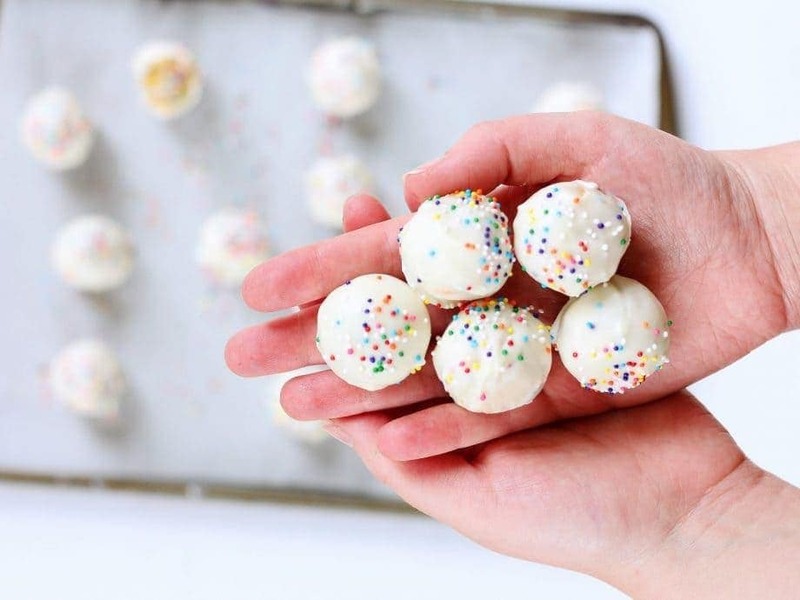 No bake birthday cake truffles are a fun treat to make for birthday parties! Each bite is filled with cake flavor and sprinkles. I’m back with a new no-bake truffle recipe ladies and gents. And the flavor is… drumroll please… birthday cake! These little guys will give you the sugar high you deserve on your special day. Biting into a birthday cake truffle is like an explosion of sugar confetti in your mouth. As if cake mix wasn’t sweet enough, this truffle recipe adds another half cup of sugar and rainbow sprinkles to the mix. The colorful sprinkles are probably my favorite ingredient in these no-bake truffles. Don’t they just make you feel happy and ready to celebrate? Of course when using cake mix for truffles you have that unmistakable (and super-addictive) birthday cake flavor. You know the one, super sweet and vanilla-y, the flavor that gets your tastebuds tingling with sugary delight. I’m still not sure what they put in cake mix to achieve that flavor, but boy is it difficult to resist. 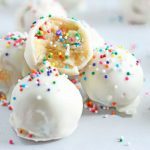 While making these birthday cake truffles, I was thinking that ideally I would know someone with a birthday coming up, but that wasn’t the case! Of course, that doesn’t stop me from baking a birthday treat. It’s someone’s birthday somewhere, right? Luckily I have friends who like to eat and willingly volunteered to taste-test the birthday cake truffles. They said these truffles are their favorite no-bake dessert I’ve made so far (*self high five*). Fitting for any occasion, I almost named these sugary delights unbirthday cake truffles. The recipe for birthday cake truffles is pretty simple. Combine the yellow cake mix, sugar, flour, butter and vanilla in a food processor and blend until dough forms. Transfer to a medium bowl and stir in the sprinkles by hand. Roll dough into one-inch balls and place on a cookie sheet lined with wax paper. Stick them in the freezer for 10 minutes to firm up. 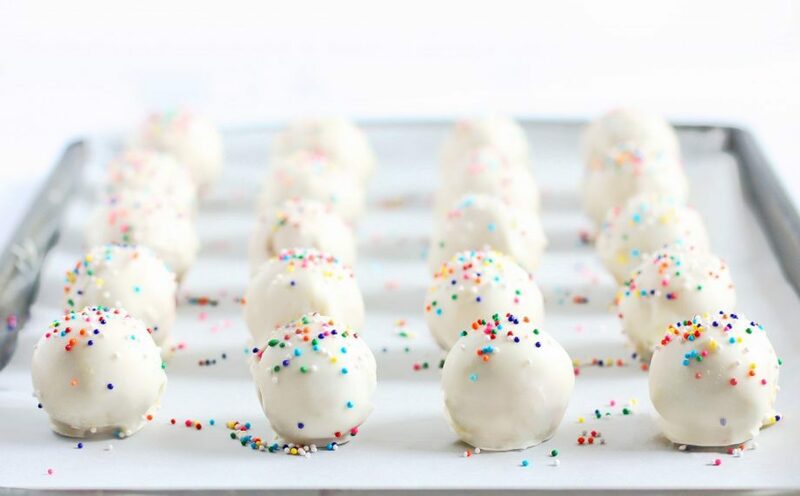 Dip the truffles into melted white chocolate, garnish with more sprinkles and there you have it… no-bake birthday cake truffles! 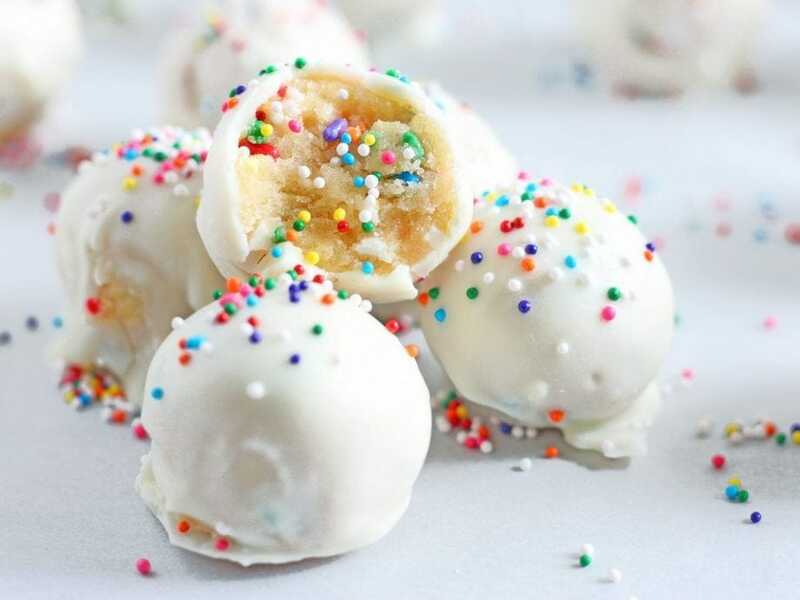 White chocolate was my go-to shell for the birthday cake truffles, but almond bark or candy coating will work well too. I personally love how the rainbow nonpareils really pop against the white shell. Store them in a tupperware or plastic bag—the truffles travel well thanks to the hard shell. Gift them to the birthday girl/boy or keep them all to yourself. Birthday cake truffles taste delicious either way! Pasteurize flour: Place flour in a microwave safe bowl and microwave for about 1 minute and 15 seconds, stirring every 30 seconds, until the flour reaches an internal temperature of 160 degrees F. This method will kill any bacteria. Let flour cool to room temperature. In a food processor¹, combine flour yellow cake mix, sugar, butter and vanilla extract. Blend until a firm dough forms and there are no lumps left. Remove dough from food processor and into a medium bowl. With a large spoon stir in rainbow sprinkles. Roll dough into 1-inch balls and place on a large baking sheet covered with wax paper. Place dough balls in freezer for 10 minutes. While dough is chilling, melt white chocolate in a double boiler², or in the microwave in 30 second increments, stirring each time. (See tips for melting chocolate here.) 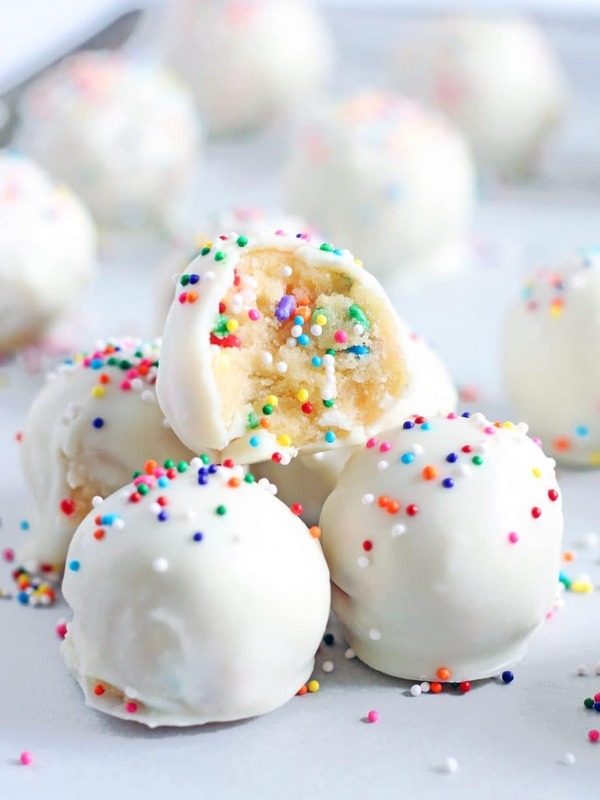 Dip truffle balls in melted white chocolate using toothpicks or a fork. Return to wax paper and immediately sprinkle the tops with rainbow nonpareils. Let truffles coating harden in the fridge for 20 minutes. Store in an airtight container for up to a week. ¹ A hand mixer may be used in place of a food processor. ² Learn more about double boilers and why to use them here. Recipe adapted from Novice Chef. Thanks, GiGi! I’d be lying if I said they weren’t! Thanks, Megan! I had to give them to friends because I couldn’t keep them in the house. So addicting! Thanks for sharing at the “What’s for Dinner” link up! How about chocolate too ? Oh my Yum!! Sprinkles on ALL THE THINGS!! Excited to try these! But the extra sugar… Is it necessary for the texture? Could I leave it out? Obviously, they’re not going to be “healthy”, but it just seems like an awful lot of sugar! ? Also.. Love the name of your blog! So clever! Hi Emily! Thanks for stopping by and commenting! I think the extra sugar creates a better texture, but you can leave it out if you want a less sugary birthday cake truffle. If you choose to do that, decrease the amount of butter to 6 tablespoons. Happy baking! You had me at no bake! Definitely need to try this for the summer birthday parties! Definitely worth trying this summer! I added them to your link party. So fun! Oh my!! These look beyond decadent and delicious. Beautiful pictures too! So colorful, what a great party treat they would make. Thank you, Mistie! Birthday cake truffles are perfect party treats. These look so yummy! PInning to try later! These are birthday celebrations in a bite!! Pretty, festive and I’m sure mouth watering delicious. That’s why I chose it as my Featured post at Thank Goodness It’s Thursday! I hope you’ll come link up some more delicious goodness with us!! Hi Becky! Thank you for selecting my truffles to feature on Thank Goodness It’s Thursday. I love that link up and have added it to my link parties list (www.ifyougiveablondeakitchen.com/link-parties). Yum! These look amazing. I need to try these. Birthday Cake-balls are my favorite at Starbucks! I love the colour of these! They simple just POP with excitement on the screen! Hmm, now I want Birthday cake! Haha I love to hear that, Laura! Hi, just a quick note to let you know that I’ve featured this post today on The Really Crafty Link Party Features. Come and grab an “I was featured” button and browse around for the other features here: http://keepingitrreal.blogspot.com.es/2016/05/the-really-crafty-link-party-19-featured-posts.html. Congratulations! These look amazing! I’m pinning so I’ll have this recipe on hand so I can make it very soon! Aw thanks, Lisa! Let me know how they turn out! I like this recipe, but have found a shortcut/easier version using crushed birthday cake Oreos and cream cheese, then dipping in white chocolate..
That’s a nice adaptation, Tamye. Thanks for sharing. Unless I’m missing it somewhere, I’m just curious on roughly how many this recipe makes? Thank you! I don’t have a food processor will a mixer work ok? Hi Rachael – Yes, an electric mixer should work too. Just make sure to mix thoroughly so it creates a firm dough. I love that these are NO BAKE!! Great idea. I will be making them this weekend. THANKS!!! Hi Traci – you can pasteurize flour at home by microwaving it for about 1 minute and 15 seconds, stirring every 30 seconds, until the flour reaches a temperature of 160 degrees F. This method will kill any bacteria. Alternatively, you can place the flour on a cookie sheet and bake at 350 degrees F for five minutes and then let it cool to room temperature before proceeding with the recipe. Although, usually there is no problem using flour if it is fresh. We made these for a party, and they turned out great! We used a hand mixer to mix the softened butter, cake mix, flour, and sugar rather a food processor. We had to mix it longer as a result, and compress the filling a bit with our hands, but after this, they rolled easily and were delicious. Just stumbled on your recipe and decided to give it a try! They are out SOO good! I’m not sure if my climate is a little drier than yours but the mix was super crumbly. Nothing a tablespoon of coconut oil couldn’t fix! Did half in white chocolate and half in dark with edible glitter and they’re just so pretty !! Thanks for sharing this recipe!! In the process of making these now and had a question about the sugar but I think you answered it about texture! Will come back after I dip them! The batter is delicious! I used cake flour I don’t think that makes a difference but heated up in microwave too. Thank you for the feedback, Bea! Yes, cake flour shouldn’t make too much of a difference and heating up flour is always a good decision to make! Does it have to be yellow cake mix? I have French Vanilla and party rainbow chip. I’m site it’ll be fine bit thought I’d ask first. These looks so pretty and delicious. I love the idea of skipping having to make a big cake and making these instead for birthdays. Oh my gosh, I love the look of these! It’s so easy, fun and obviously delicious 🙂 I need to make these with the neighbor kids…pinning! Thanks for the great recipe! Love the sprinkles! No bake desserts are always good! I love that these are no bake! They look perfect and delicious!! I can’t wait to try your recipe for the next birthday, which is my niece, so these will be perfect with the sprinkles! Is there any way to do this recipe without the yellow cake mix since we don’t have it here? So I don’t know if I’m crazy but a quarter cup of butter is not enough for this recipe. I needed a half a cup. I mixed the jar with a quarter cup of butter for 20 minutes and it was still powder. I used a second stick and they were perfect. Hi Tianna – The recipe calls for 1/2 cup (1 stick or 8 tablespoons) butter, not 1/4 cup.